Hush earbuds were designed to block out noise to allow for better sleep, but connect with the user’s phone so they can still hear alarms or emergency notifications. Photo by David Baillot. 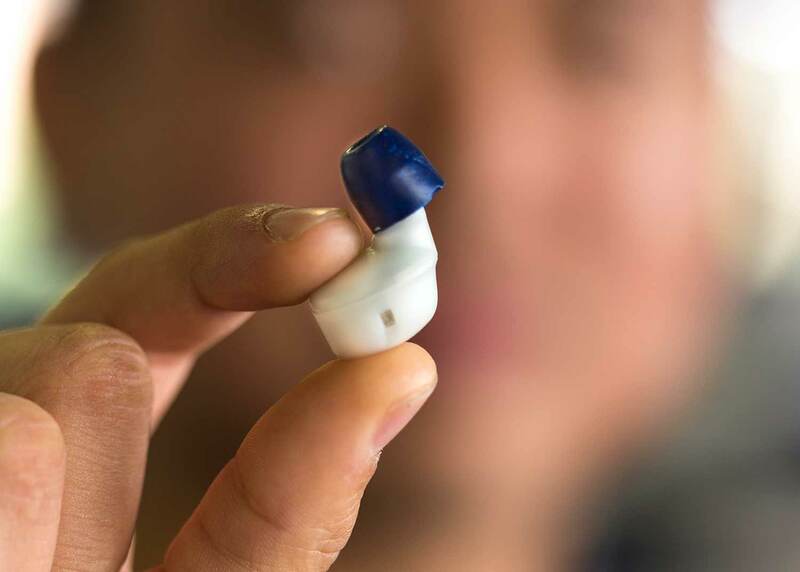 Hush, a noise-cancelling smart earplug startup company that was conceptualized by UC San Diego engineering undergraduates in professor Nate Delson’s Product Design and Entrepreneurship class has been acquired by audio giant Bose. Daniel Lee, co-founder and CEO of Hush and a 2014 mechanical engineering graduate, said the acquisition was finalized in August 2016, but not announced until November 2017. The details of the deal are not disclosed, but Lee said the Hush product has been fully integrated into Bose’s noise-masking sleepbud product line. 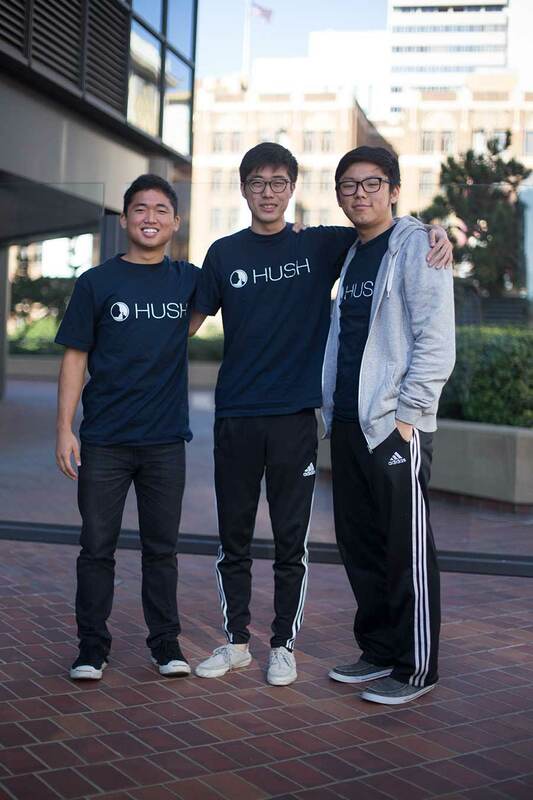 (l-r) Daniel Lee, Daniel Synn and Daniel "Chesong" Lee developed the Hush concept and company as undergraduate engineering students at UC San Diego. Photo by David Baillot. Hush developed the world’s first smart earplugs, equipped with noise canceling and white noise options to help people block out noise while they sleep, but still connect to their phone to allow alarms and emergency notifications to reach the user. “The most intriguing thing to Bose was that we had a near identical vision to a product concept they were incubating, and consequently had a ton of valuable technical and market learnings from shipping a first-generation product from which to apply to Bose noise-masking sleepbuds,” Lee said. Daniel “Chesong” Lee, another of the three student founders, moved with Daniel Lee to Bose’s headquarters outside of Boston and is leading app development for the sleepbuds. The third team member, Daniel Synn, stepped away from the company a year into the endeavor for personal reasons. “The idea for Hush initially started as a homework assignment for Dr. Delson’s entrepreneurship course, so I’d say Professor Delson and UC San Diego were very important for the idea to have happened,” Lee said. Delson, who created the Product Design and Entrepreneurship class at the Jacobs School of Engineering after seeing first-hand the gap between the technological side of building a product and the business side of finding a market for it, said the Hush acquisition is great news. The ultimate goal for the students taking his class is to identify a market need and match it with a technological solution. Whether the students end up with a commercial success or not, they end up learning about the challenges of developing new products. Delson said often business schools focus solely on the business model or market need, while engineering schools focus only on developing technology. Product Design and Entrepreneurship encompasses both. During the 10-week class, each student comes up with three different product ideas which get whittled down to one that they pitch to the class. Students self-select teams of three or four and one idea they will focus on, and then spend the course learning the ins and outs of starting a company—intellectual property, manufacturing, marketing, consumer studies and more. At the end of the quarter, the teams pitch their products to a panel of local entrepreneurs, technologists and venture capitalists, and the winning team earns a cash prize for further development of their prototype. Hush won first place in that competition in 2014, and $2,000 from VentureWell and the Moxie Foundation, which supported the class. The team members decided to pursue the concept after the course ended and start a company. They were accepted into the Moxie Center for Student Entrepreneurship at the Jacobs School of Engineering, where they were mentored by Jay Kunin, a serial entrepreneur and executive director of the Moxie Center. In addition to workspace, tools and mentorship, the Moxie Center offered insight on intellectual property issues and manufacturing, as well as 3D printers, a machine shop and electronics fabrication for prototype development. Hush was then accepted into San Diego’s EvoNexus startup incubator, where they secured nearly $600,000 in funding through a Kickstarter campaign, and worked through design and manufacturing details for their earplugs until their acquisition by Bose. Lee said the help and mentorship of UC San Diego’s entrepreneurial community was vital to Hush’s success. “UC San Diego provided different functions and pitch events like the Moxie Center, which were vital to creating the environment for us to have taken the product concept seriously,” Lee said. The student innovation section of the UC San Diego Office of Innovation and Commercialization website captures the many entrepreneurship resources, including The Basement, offered to UC San Diego students.